UTC STANDS FOR URBAN TRANSFORMATION CENTER. It provides core services of the Government and the private sector in a one-stop center or in a single building. This saves you the trouble of having to go to different buildings in different parts of the city. WHEN THE UTCs WERE INTRODUCED, WE FOUND THE SERVICE PROVIDED BY ALMOST ALL GOVERNMENT DEPARTMENTS TO BE QUICK AND EFFICIENT. THE DAYS AND TIME WHEN THE UTCs WERE OPEN WERE WHAT WE NEEDED: SUNDAYS AND PUBLIC HOLIDAYS, AND EVEN AT LUNCH TIME. The hours were longer, too. WE HAD HOPED THAT THINGS WOULD NEVER CHANGED, AND IF THEY DID, IT WOULD BE FOR THE BETTER. NO, CHANGE HAS COME AND FOR THE WORSE. WE DON’T CARE WHAT YOU THINK. WE ARE NOT YOUR SERVANTS. WE ARE GOVERNMENT SERVANTS, LORDS OF ALL THE NATION! KUCHING: Members of the public were caught unaware by the closure of Urban Transformation Center (UTC) for Friday prayers yesterday, and for a break from 6.30pm-7.30pm daily.It is closed at 11.45am to 2.15pm on Fridays. Abang Abdul Rauf, 23, company worker, said he thought that as UTC had longer hours, it would not be closed at all during the stipulated opening hours. He said that he and his family arrived at 11.30am and the doors were already locked, leaving the family of five to wait until it reopened at 2.15pm. “We drove four hours from Spaoh to register the birth of our child in the hope that it could be done faster here than back home as there was a long queue there. I came before to check the opening hours but I did not know that they closed for Friday prayers,” he said. He came with his wife, child and two relatives. He pointed out that it was not tenable for all staff to be Muslim, in that they needed to close, adding that they could have taken turns to keep at least one counter open. Meanwhile, an officer at the information center, Nicole Choo, said that all services at UTC would be closed for Friday prayers, one hour dinner break daily and on public holidays, except the state government agency as it closes at 8pm. She added that it was also a directive from the Ministry of Finance to close for Friday prayers. The public can also visit UTC Sarawak Facebook page for opening hours and other updates. Asked on why the doors were locked at 11.30am on Fridays; and 6.30pm and 8.30pm at night, she said that this was to stop the issuance of queue numbers. No service at UTC in Kuching, Miri and Sibu on polling day, 7 May 2016. The UTC Sarawak is at Top Spot Taman Kereta, Kuching. Opening hours: 8.30am-9.00pm daily, except public holidays. 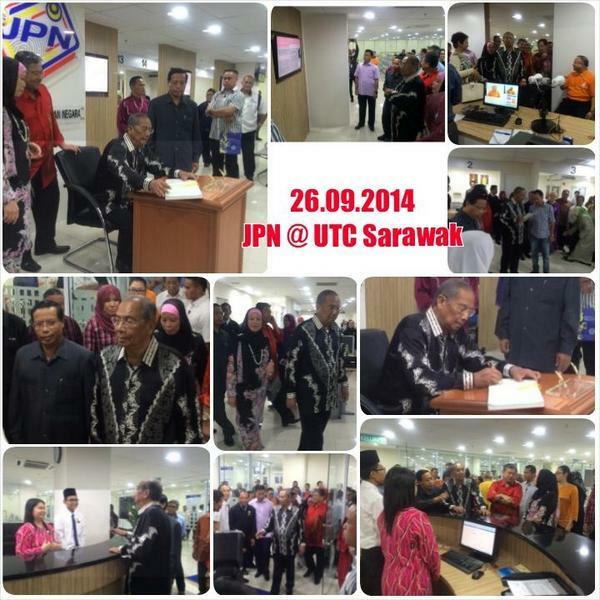 This entry was posted in Uncategorized and tagged 8.30am-9pm daily, closed on public holidays, UTC Sarawak in Kuching. Bookmark the permalink.